General Hospital (GH) spoilers tease that Tamara Braun’s (ex-Carly) return is rapidly approaching. She’s playing a brand-new character this time around and viewers are buzzing about who she’s going to be. It seems likely that Braun will portray Dr. Kim Nero, Oscar’s (Garren Stitt) mother. 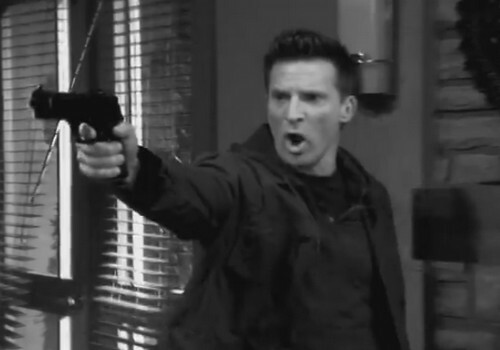 It also appears Braun’s character will have a stunning connection to the Patient Six (Steve Burton) storyline. The latest General Hospital promo offers proof of that connection. GH fans caught their first glimpse of Braun in the recent preview video. This promo was all about the brother battle and the people who are caught in the fallout. Since no other stories were featured, Braun has to be tied to this hot plot. General Hospital spoilers state that Braun will show up in Port Charles starting November 22. Carly (Laura Wright) will also open up her home to guests that day, presumably to celebrate Thanksgiving. There’s a good chance Carly will talk Kim and Oscar into coming over for a holiday dinner. Naturally, Sonny (Maurice Benard) and Carly will also want classic Jason to join them. They’ll be happy to have their good buddy back for the festivities. None of them will expect the chaos that’s brewing. The promo shows Braun’s character gaping in shock as she rises to her feet. She looks like she’s seen a ghost – of her past anyway. Will Kim recognize Patient Six as her old love and Oscar’s father? That would lead to some extremely soapy drama! Of course, the memory mapping will make all of this more complicated. Drew may be Oscar’s dad, but we’re currently dealing with twins who believe they’re Jason Morgan. Regardless of who Patient Six turns out to be, Kim will recognize his old face. She’ll undoubtedly be shaken up after this initial sighting. Kim, Patient Six, Carly and Sonny may hide this development from Oscar and Josslyn (Eden McCoy). It’d be better to wait until they have all the facts. Kim’s link to one of the twins could actually move this story along. If Oscar’s father is indeed Drew, could some Drew-related memories finally emerge? It’d be interesting if one twin began to remember flashes of another life, but kept quiet for fear of losing his shot at being Jason. Andre (Anthony Montgomery) claims this process is irreversible, but he can’t know for sure. This is all very experimental, so nothing’s set in stone. Whatever the case, Braun’s arrival will stir up plenty of trouble. We’ll give you updates as other GH news comes in. Stay tuned to the ABC soap and don’t forget to check CDL often for the latest General Hospital spoilers, updates and news. General Hospital Spoilers: Kelly Monaco and Billy Miller Real-Life Dating Confirmed – JaSam Romance Onscreen and Off?